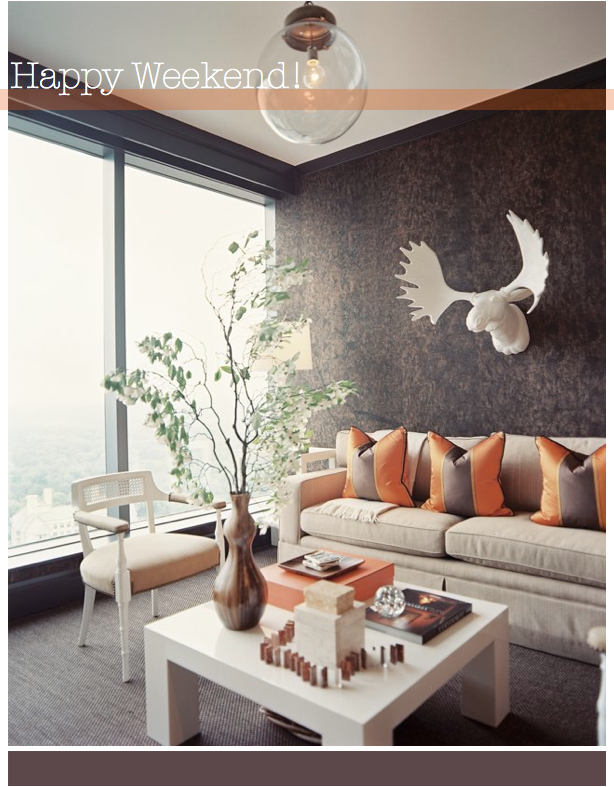 In her editor's welcome, Carmel Allen writes about pushing boundaries when it comes to interior decorating, and she makes a great point: Don't be afraid to push your comfort zone, as no matter how small your step outside of it is, you'll feel exhilarated for doing it. I couldn't agree more, Carmel! 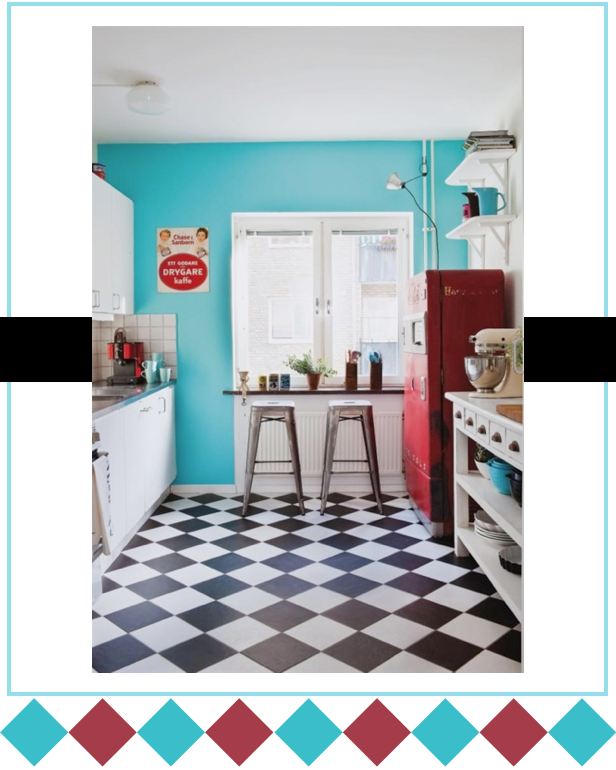 When it comes to homes, you'll see from the home tours featured on Bright.Bazaar that I feel drawn towards spaces with a quirk or something out of the ordinary. 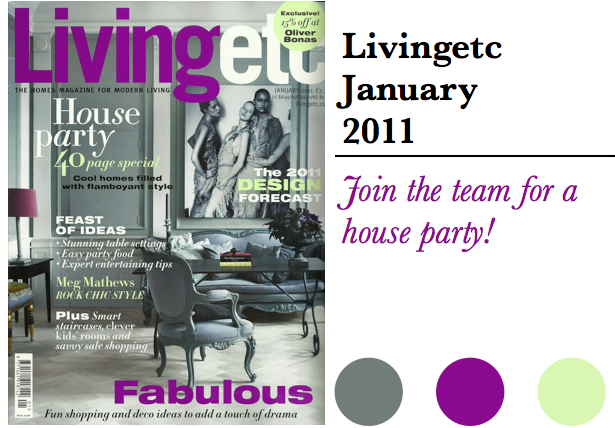 No surprise, then, that this issue is one of my favourites from the Livingetc gang in a the last few months. 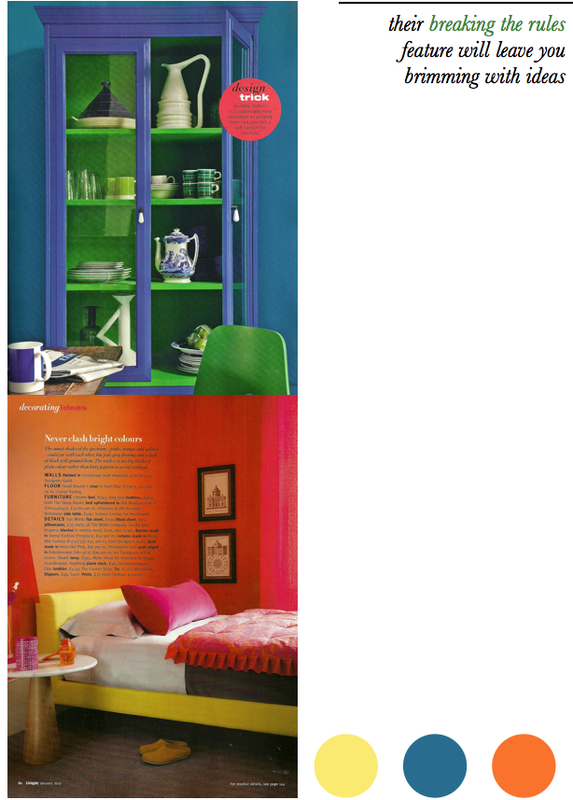 Inside you'll find a 2011 trend forecast, a tour of Meg Mathews 'punk pink' home, the best typography pieces and great ideas for table settings, amongst many more homes and product round ups. I've selected some of the editorials and stories that stood out for me. 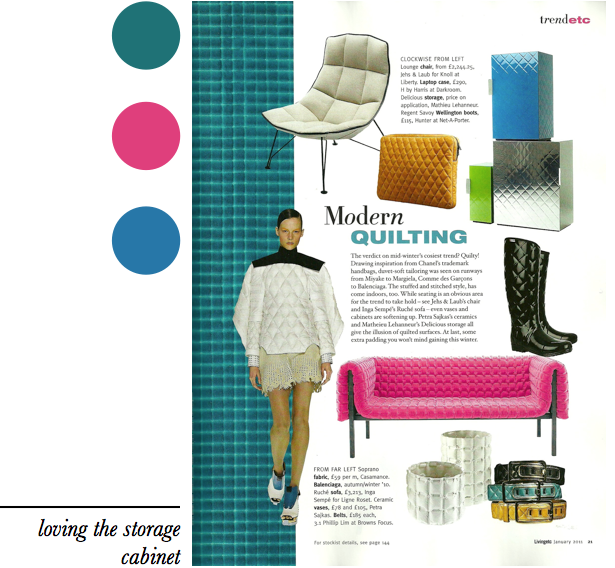 My top tearsheet? 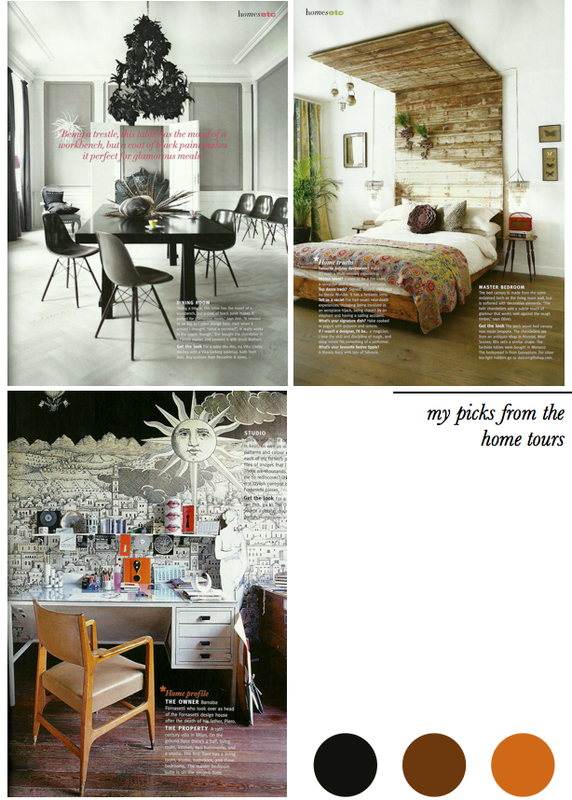 It has to be the home office of Barnaba Fornasetti (shown below in home tours) for it's mix of whimsy with clean, modern lines. Which pages call out to you? 1. 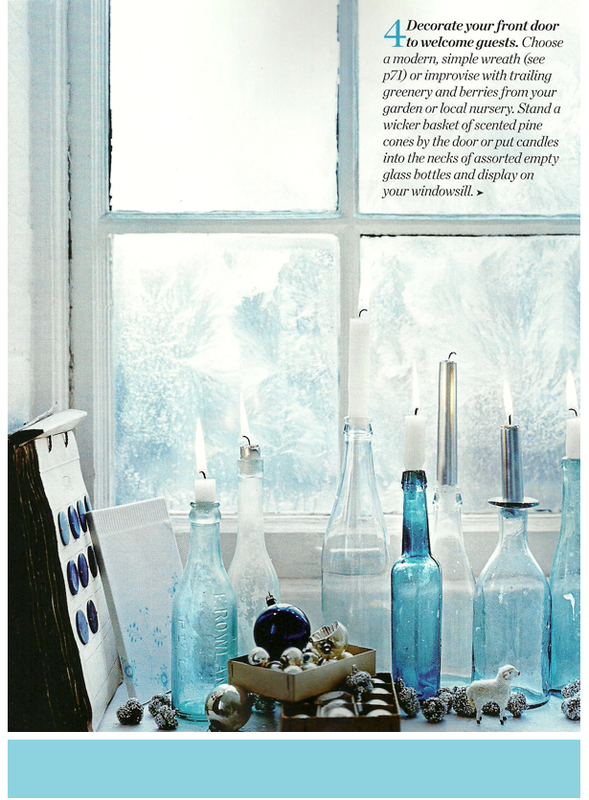 Calm and serene; this living space took my breath away. 2. Anthology magazine is the perfect fit for my Jack Spade bag. 3. 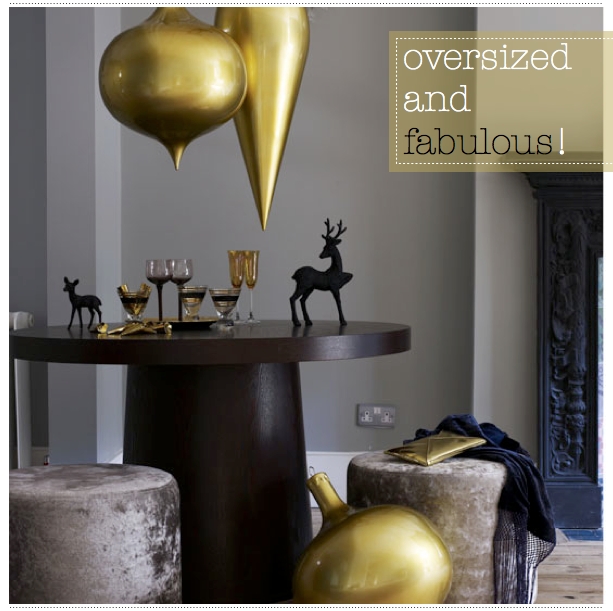 These deliciously gold bowls are flirting outrageously with my Christmas list! 4. Owls are still in my good books, especially after I found this darling fellow. 5. Starbucks jewel-coloured Christmas decorations caught my eye. 7. Oh, Joules, please stop tempting me with colourful striped wellies. 8. 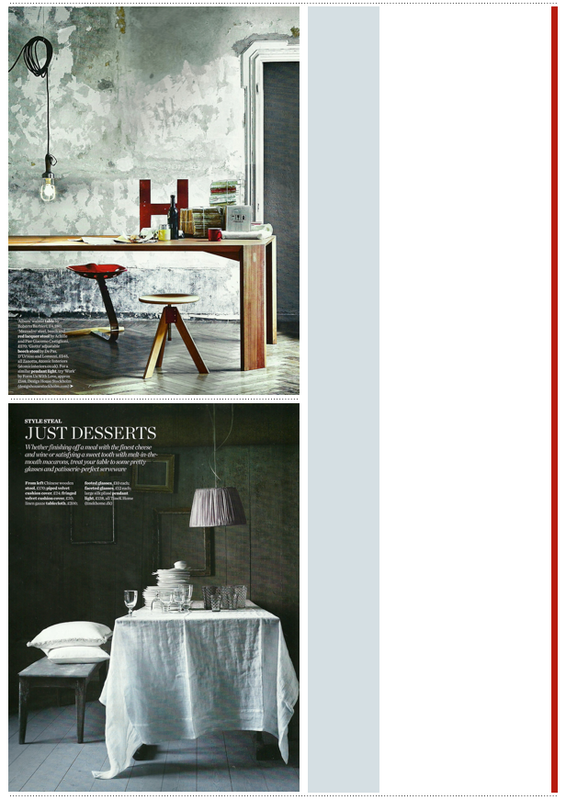 Kelly Hoppen's Home Style iPhone app is comprehensive and a great addition to any designer or stylist. 9. 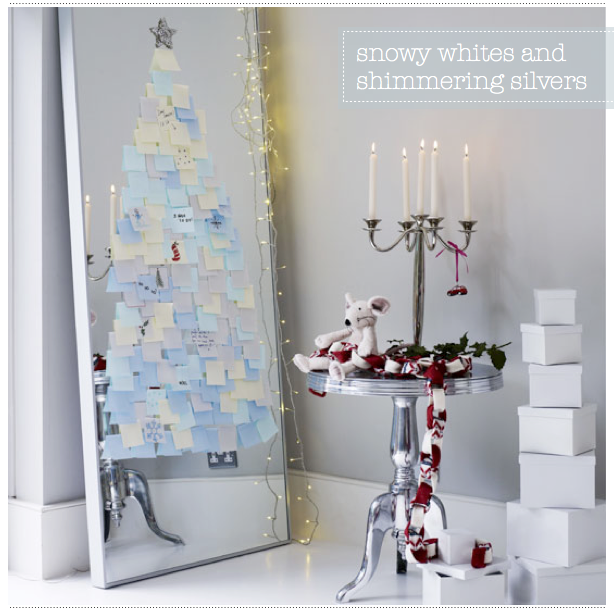 These Christmas cards are fab! 10. I fell for these hand painted baubles. 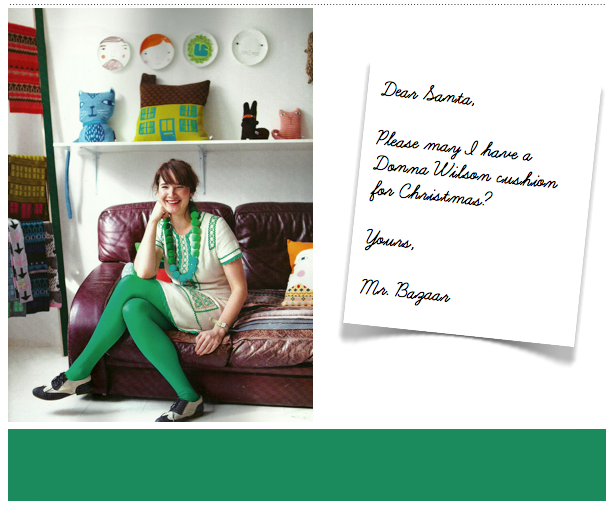 How The Conran Shop created their Magical Forest. 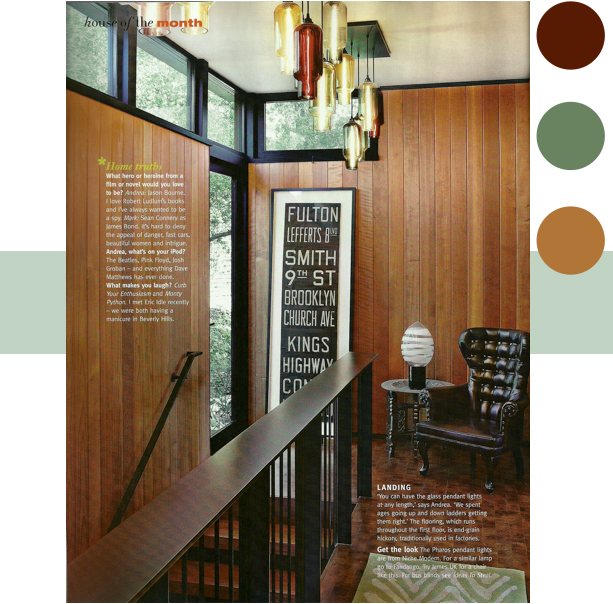 A great interview by Kelley Moore with Jonathan Adler. 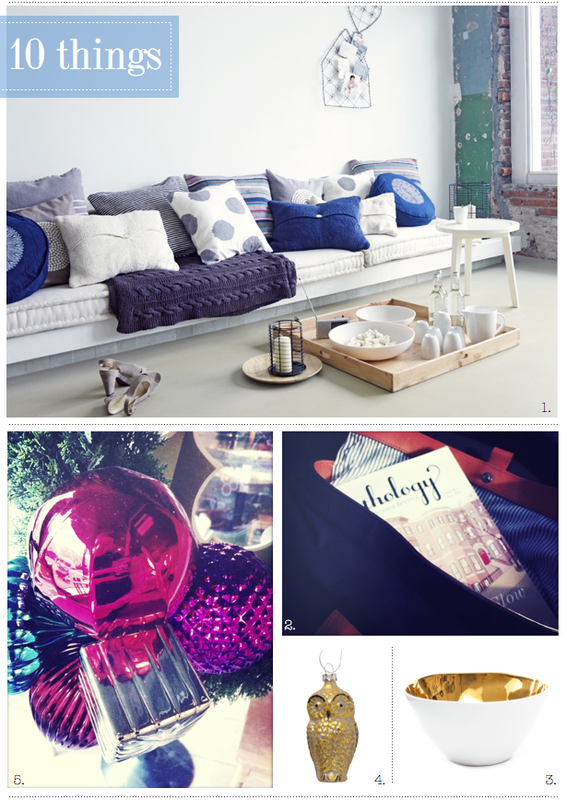 Join in the holiday gift guide fun on pinterest with sfgirlbybay. 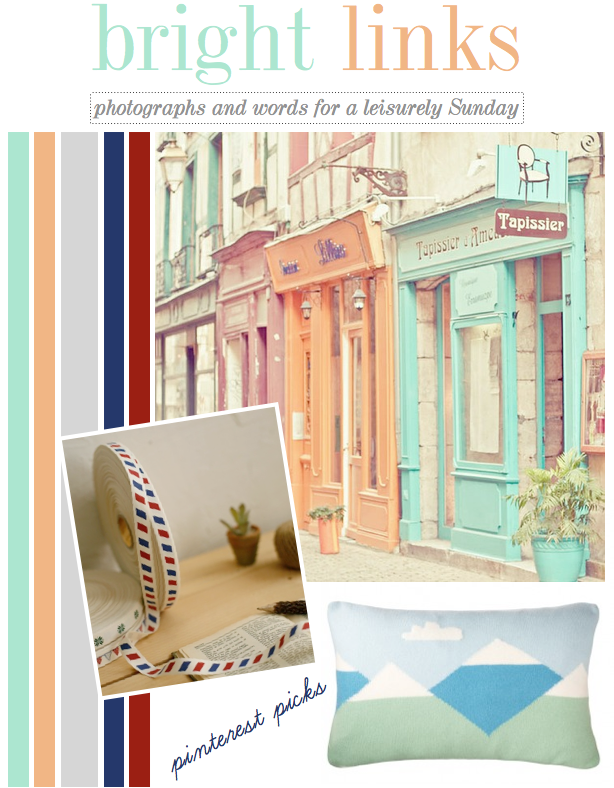 My guest post on Compai about stripes and brights. How cute is Simone Jean-Louis?! 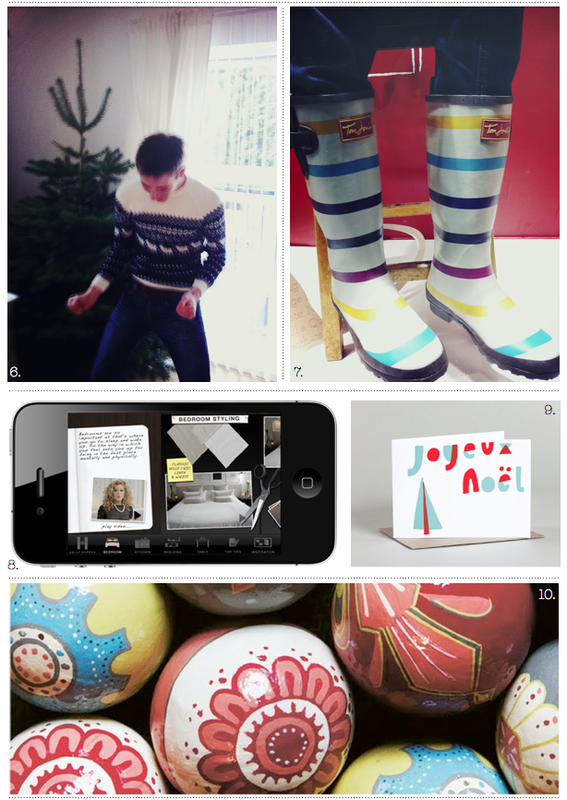 Behind the scenes video of the J.Crew holiday shoot. 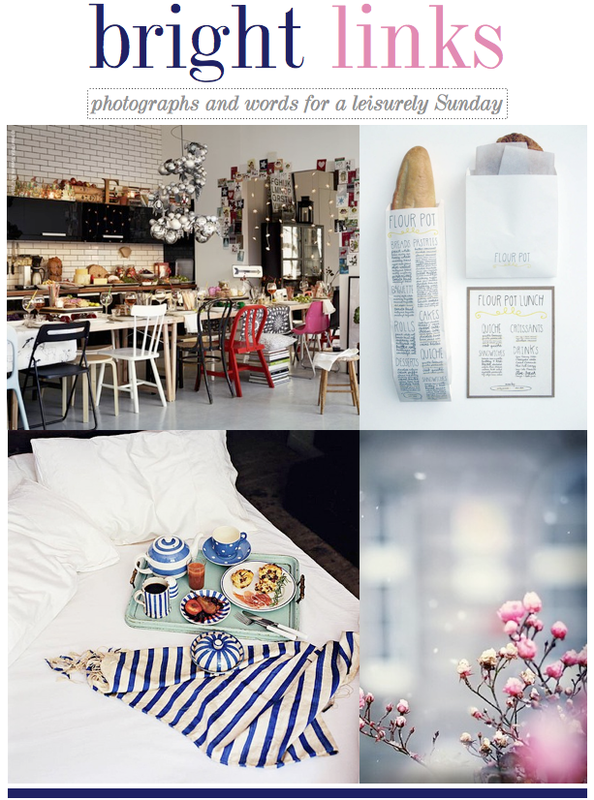 Thank you to the lovely Jan at Poppytalk for featuring my latest Rue Magazine shoot. Whatever your plans this weekend, friends, let's try squeeze in a little time for cocktails, shall we? Let's see, how would eight o'clock tonight suit? 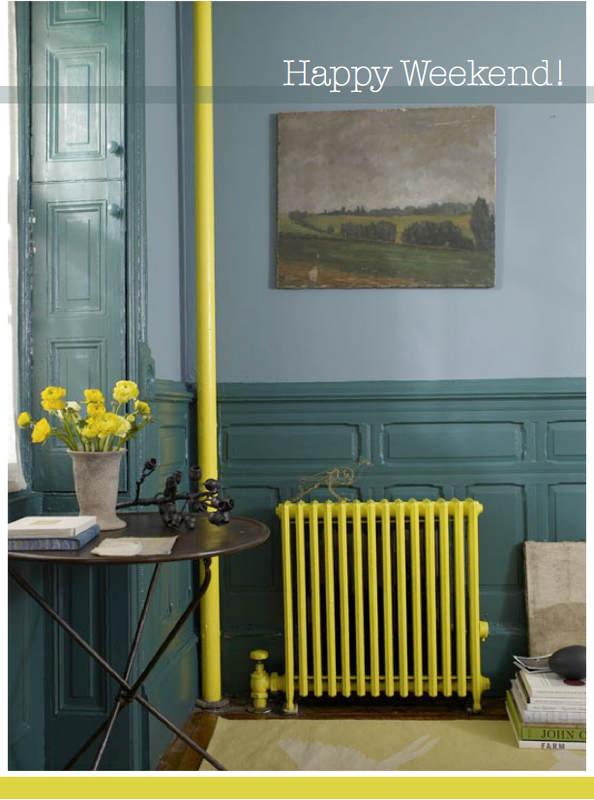 Perfect, we'll meet by the glorious yellow radiator in the drawing room. All I need to do now is find a fabulous outfit! Given the temperatures here in the UK are sub-zero this week, and with friends speaking of heavy snowfall in Vancouver and Seattle, I felt we'd all be in the mood for a warming colour cocktail to see us into the weekend. 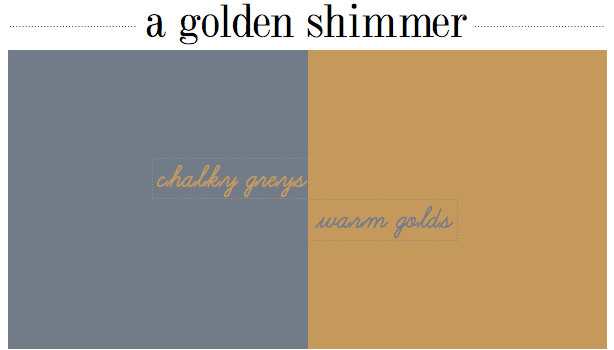 There are darker greys on the cards this week; their gentle tones make a great team when paired with a bold golden hue. 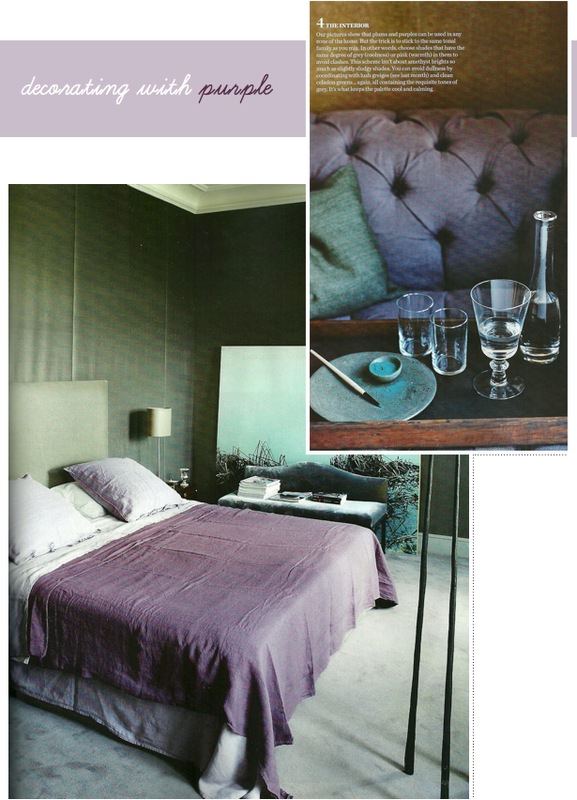 If you're a modernista and like to keep things fresh, ask for your cocktail served with an extra dash of grey as this will serve well to lift the scheme. If, however, you're more akin to all things traditional, indulge in the glamour and decadence of gold by asking for a triple shot of honey-hued goodness. You can see below how a silver-grey table and accessories dominate the modern space, whilst on the right, golden tones keep things traditional with a hint of grey in the door to add dimension to the room. 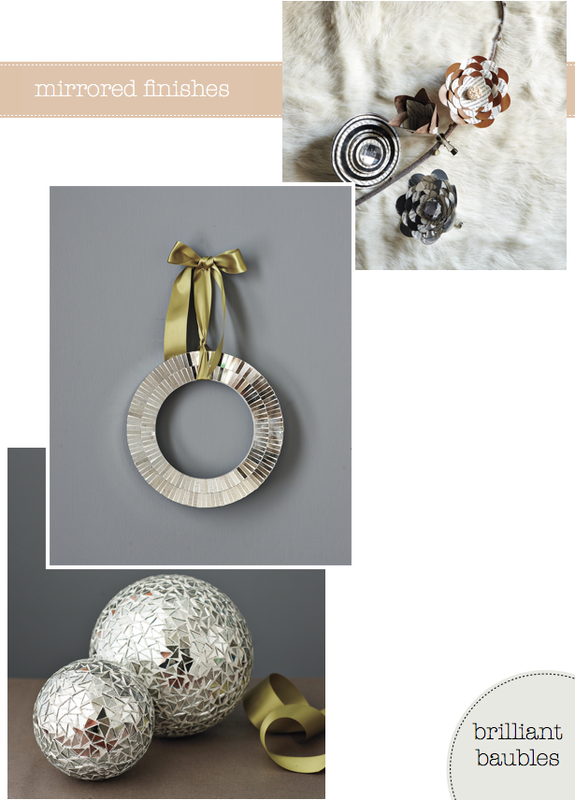 For the 2010 season, West Elm have curated an original holiday collection that oozes sophistication thanks to it's modern-meets-traditional feel. 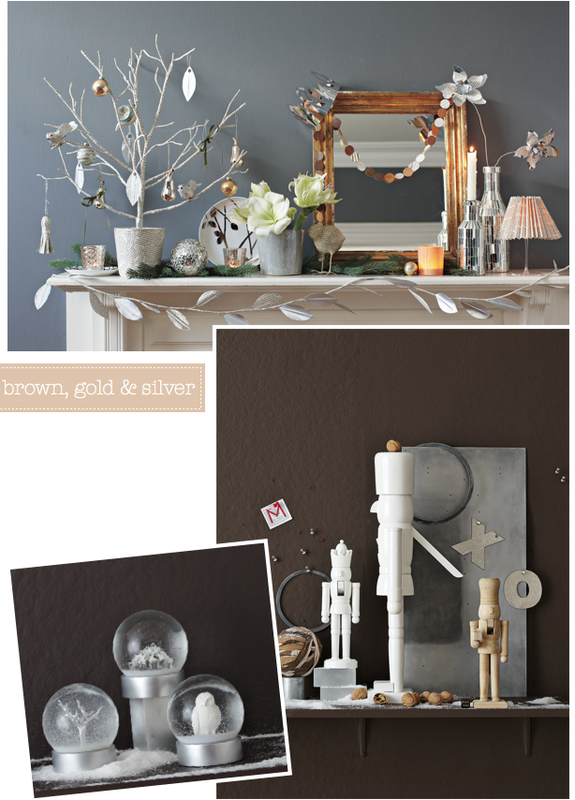 The collection is the result of a collaboration with David Stark (this guy is such an inspiration to me) and includes garlands, mirrored baubles and paper trees. 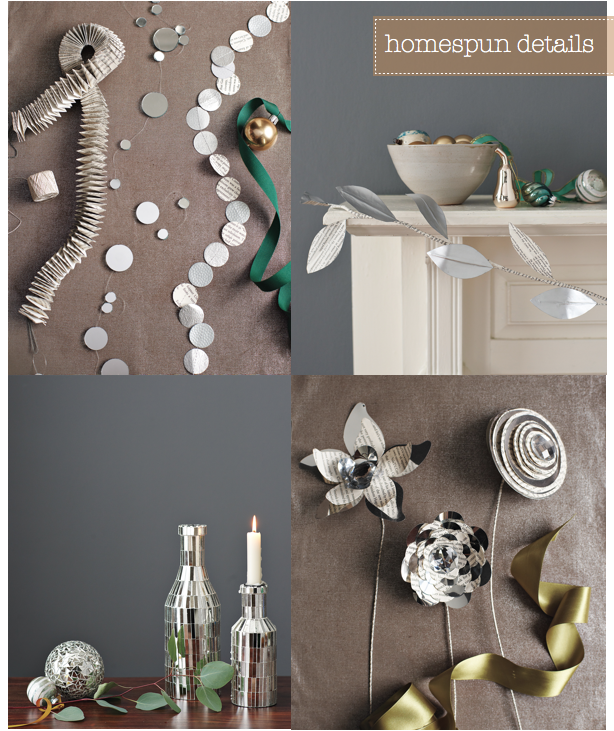 What strikes me first off is how inventive it is: circle garlands and paper flowers are used to wrap presents as well as adorn walls, whilst small leaves made from old books are used to decorate trees and as napkin ties. 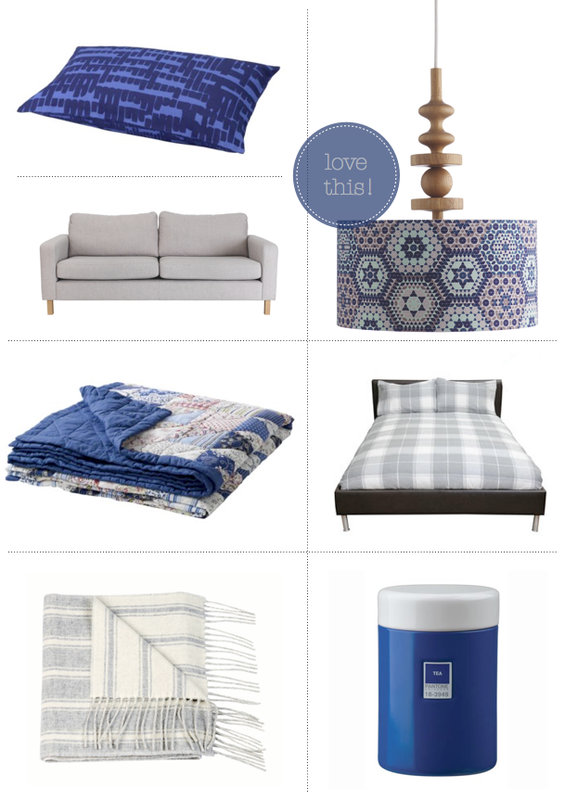 For me, West Elm have created a timeless, classy and comforting collection of decor that can be used year-on-year. Now all I need to do is find a way to convince them to open a store on this side of the pond! This kitchen space makes me one super duper happy chap. A divine slice of Sweden mixed with playful pops of colour, it's uplifting decor and bright, airy atmosphere makes for a winning combination. I can just imagine myself living in this kitchen: In the week I'd spend my mornings tap, tap, tapping away on my macbook, perched on the Tolix stools and fresh coffee brewing to my left. 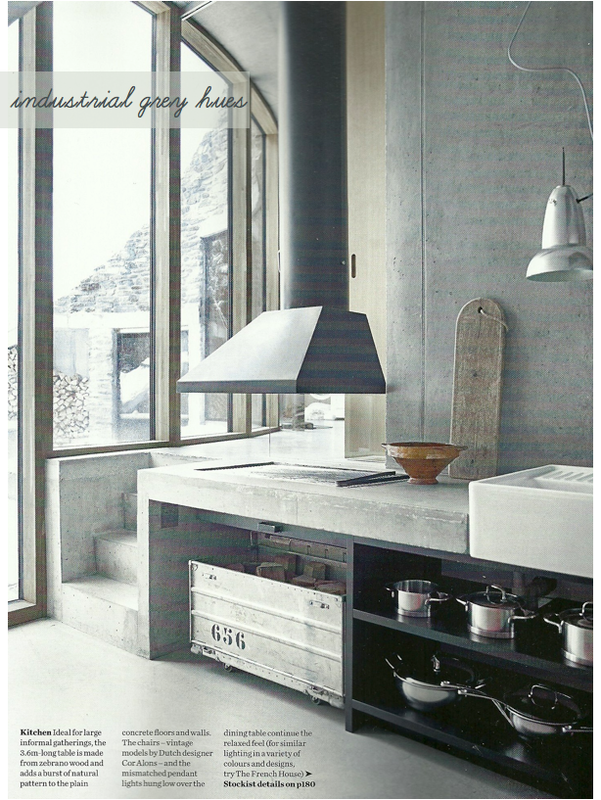 Afternoons would be spent whipping up a quick supper as the day's final rays beamed down onto the geometric floor. Then, come the weekend, the macbook would be swapped for the weekend papers and the Magi Mix would be thrown into action. Basically, this kitchen kinda rocks. 1. The hallway of my imaginary city crash pad has this coat stand. 2. 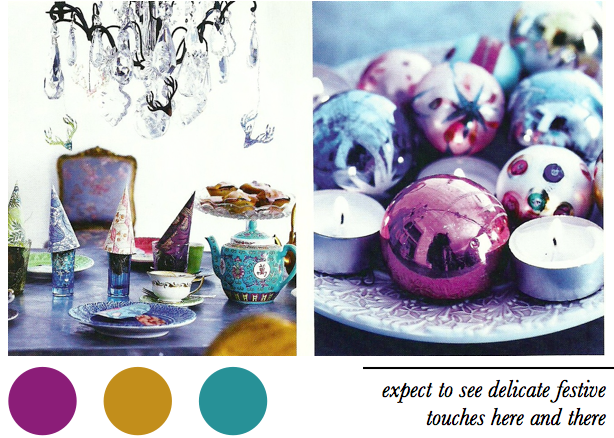 Lavish your eggs with a gold thrown! 3. Totally crushing on these hand printed stag pillows from Etsy. 4. 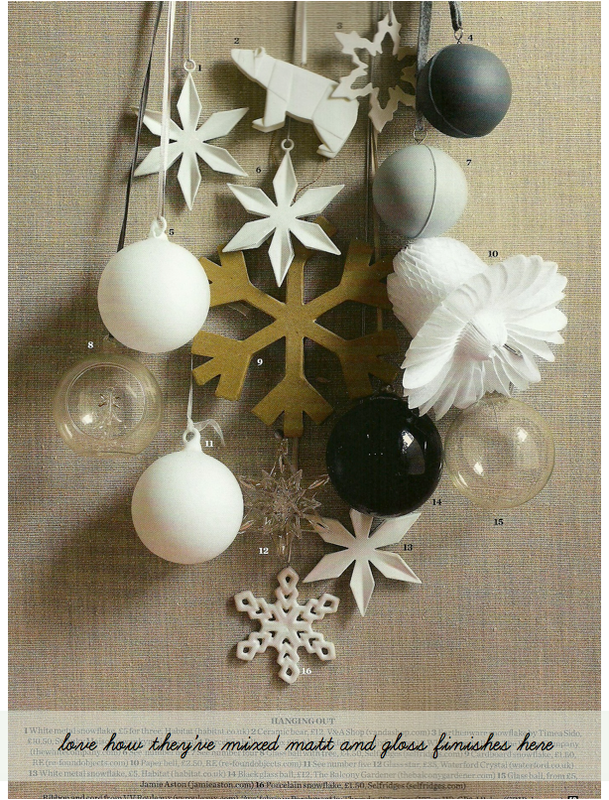 Vintage baubles? Don't mind if I do. 5. The deep purple accents in this living room are super. 6. Sandy Chang made this bow to sell in her Etsy store after feeling inspired by Friday's Colour Cocktail. Thanks, Sandy! 7. My love for bags doesn't show any sign of waning. 8. I saw the new Harry Potter movie on Saturday, which the more I look back on, the more I think I enjoyed it. 9. Recognise this knitted teapot? 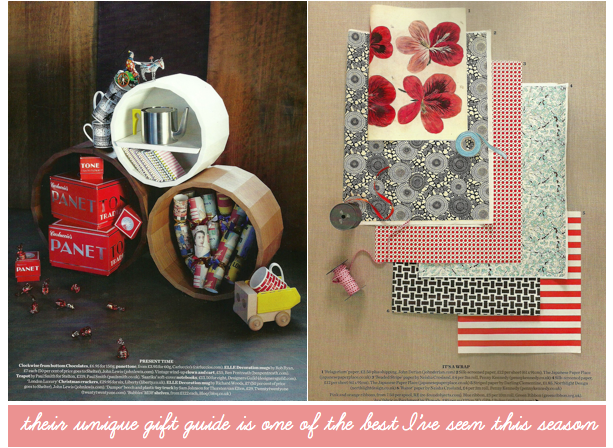 It's from the holiday issue of Sweet Paul and you can buy it, here. 10. 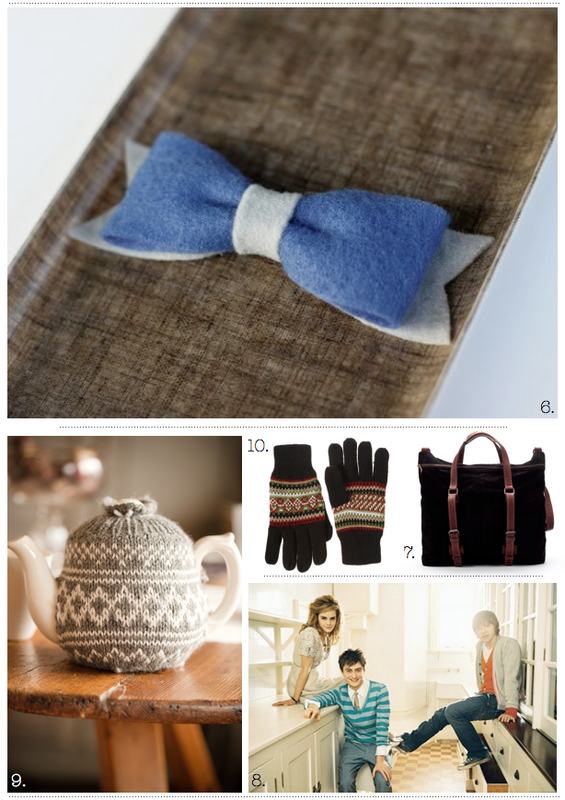 OK, so I've done the fairisle jumper, the fairisle socks and now the fairisle gloves, too! This industrial light is really striking. 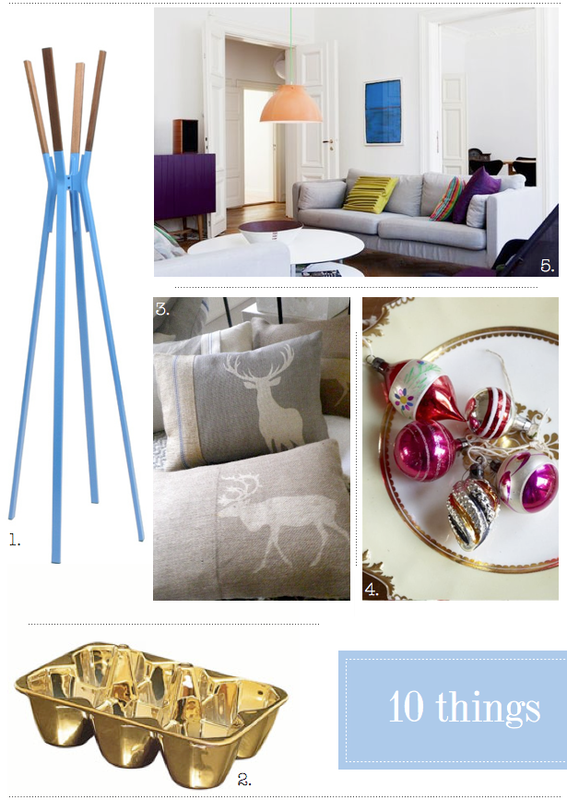 I was lucky enough to guest post over on HGTV's blog earlier in the week. These shoe clips would make great pressies for a cool chick. Water droplets and pine needles. Loved this photograph of a street performer in Rome. 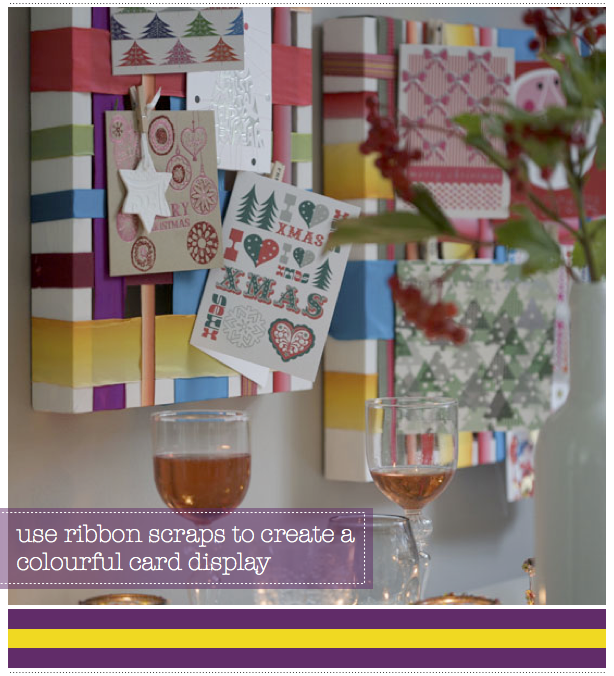 Looking for a fun printable? This make your own Owl calendar could be just what you're after. Santorini, Greece - I just fell in love with you all over again. This has been a favourite snap of mine for some time; the punchy orange hues serve to break up the deep brown and taupe tones of the walls, whilst natural light floods in through the floor-to-ceiling windows. Yeah, I think a Mr.Bazaar would be right at home in this living room! It would be a fantastic party space, don't you think? Thank you for all your kind words and support this week, friends, I hope you all have wonderful weekend! 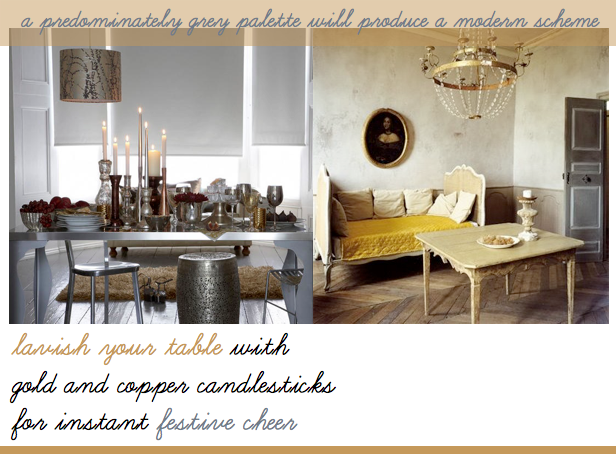 Inspired by the royal engagement, this week's colour cocktail is about adding a touch of luxury to your space. Kate Middleton looked radiant in her sapphire blue dress, dazzling the world with that ah-mazing ring. 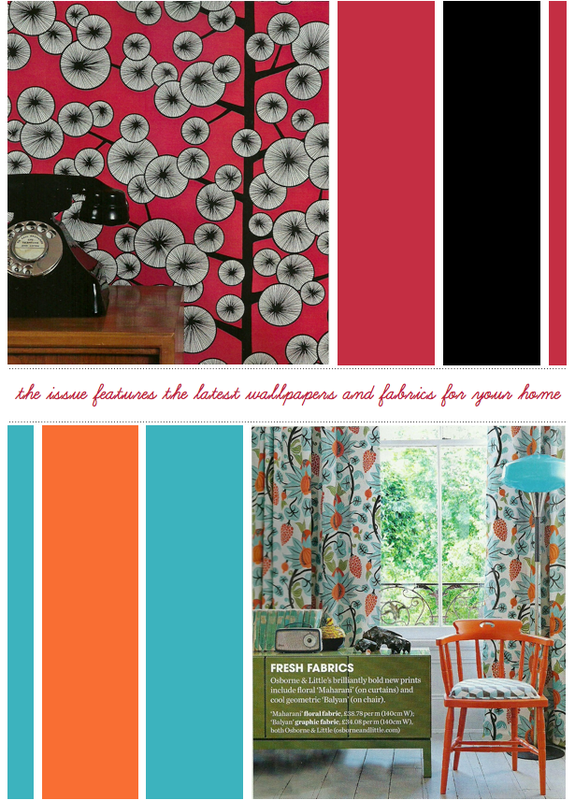 Now your home can dazzle, too! 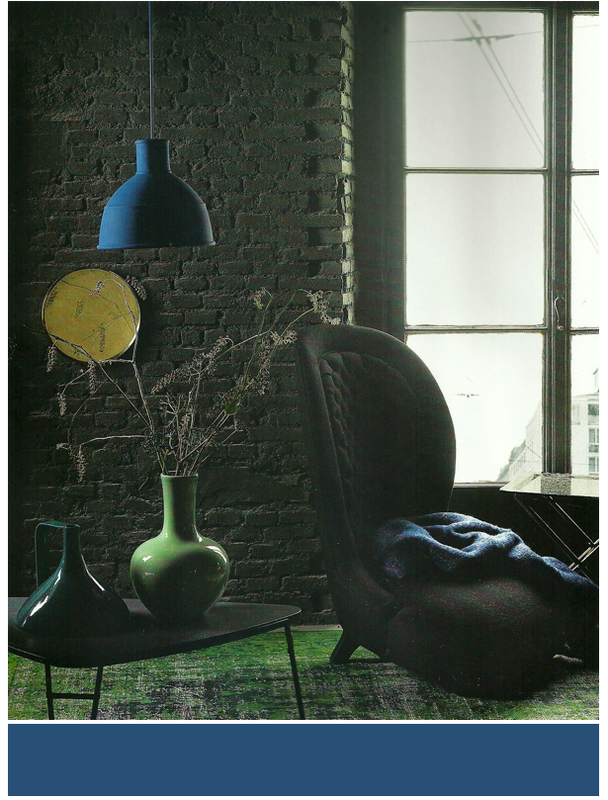 Rather than buying the over-priced engagement mug, bag yourself a new-look interior, instead. 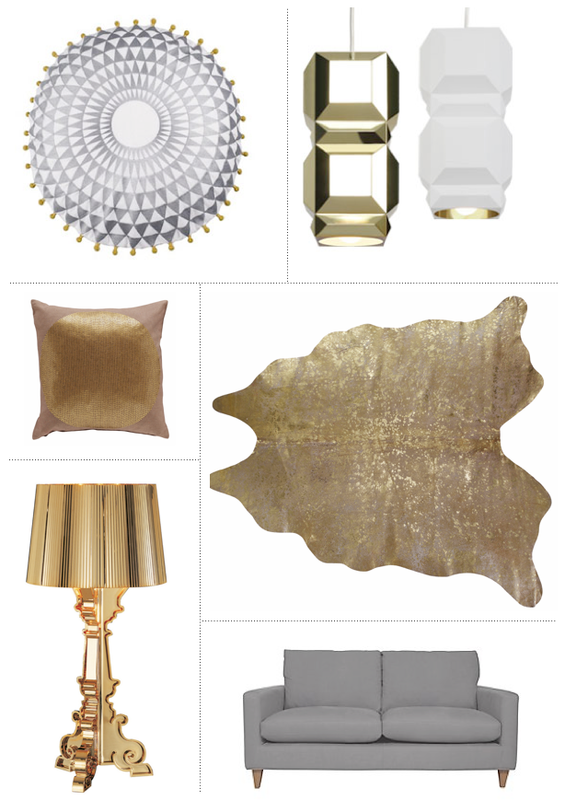 Treat yourself to a shimmering throw cushion or perhaps dress up your lighting with a glamorous new shade. 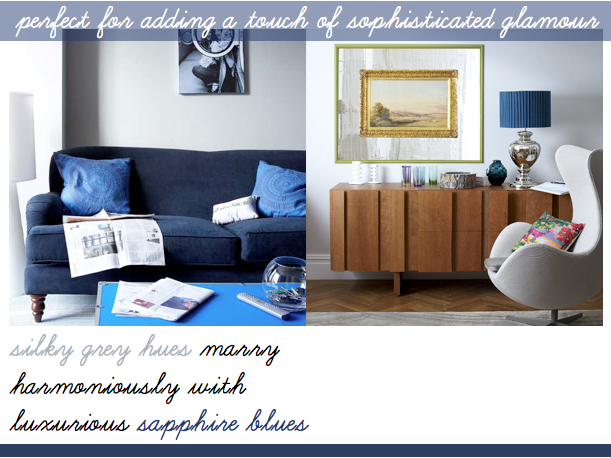 Be sure to work in some delicate grey hues to your base colour scheme, as this will ensure your homage to the royal engagement airs on the right side of sophistication. 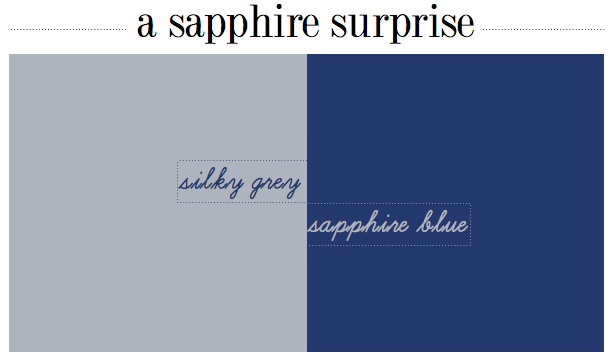 Order yourself a sapphire surprise and come next summer you'll be sat watching the wedding in your own little Buckingham Palace! 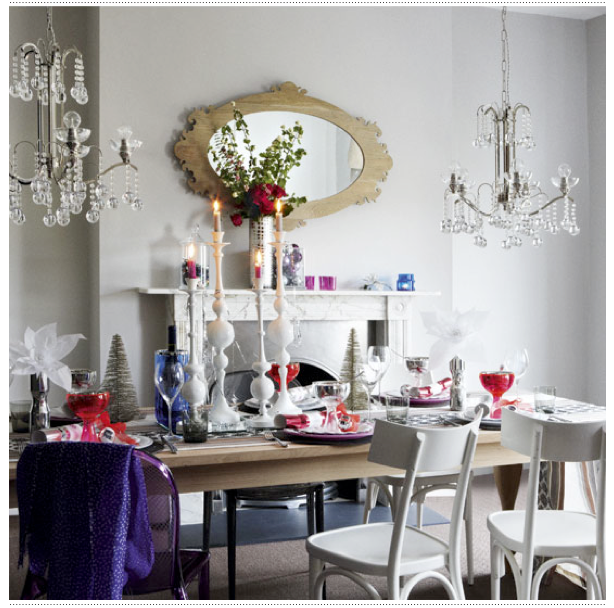 Having already dazzled us with their 2010 take on Christmas, I just knew taking a trip through the Livingetc Christmas archives would deliver yet more inspiration. I'm totally gaga about the range of different looks they've put together over the years, so I've pulled together some of my favourites and added a few decorating tips along the way. 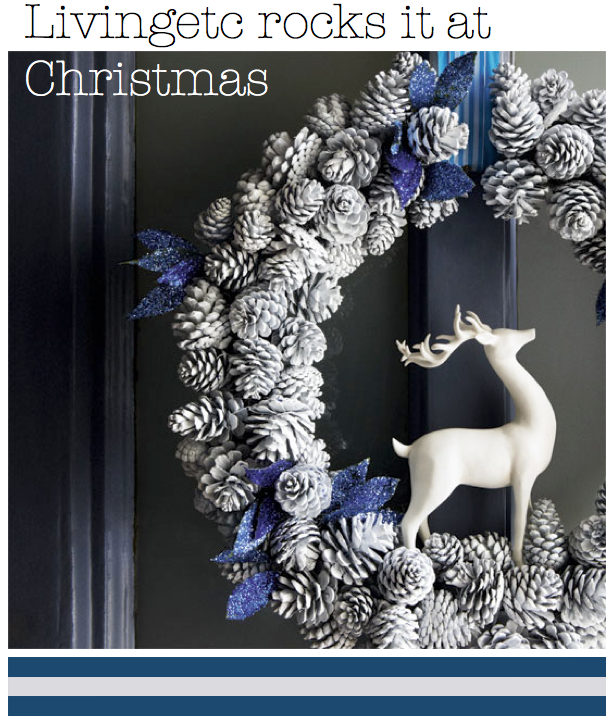 If I had to pick a top look it would be the wintry white wreath (above) with it's proud stag and peek of blue stripe ribbon. That said, it still blows me away how cool a tree can look made out of post-it notes (below). 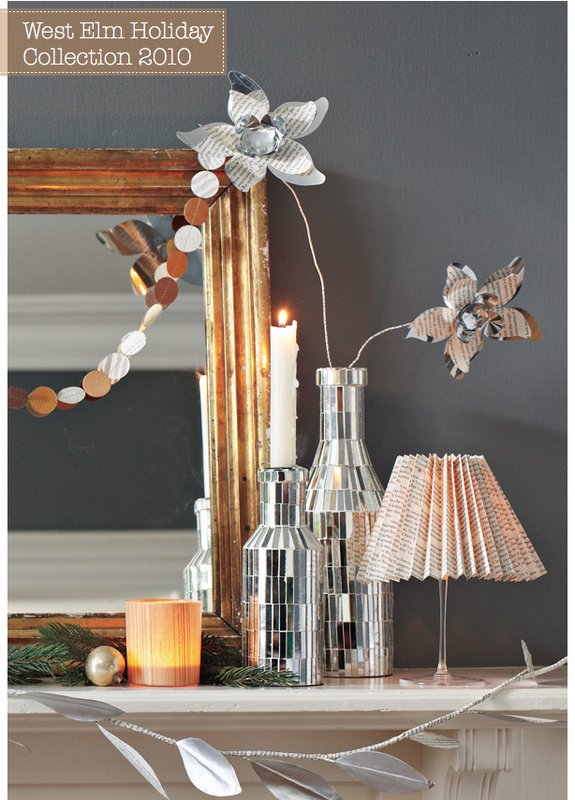 Which of the different looks have you inspired for your own holiday decorating? 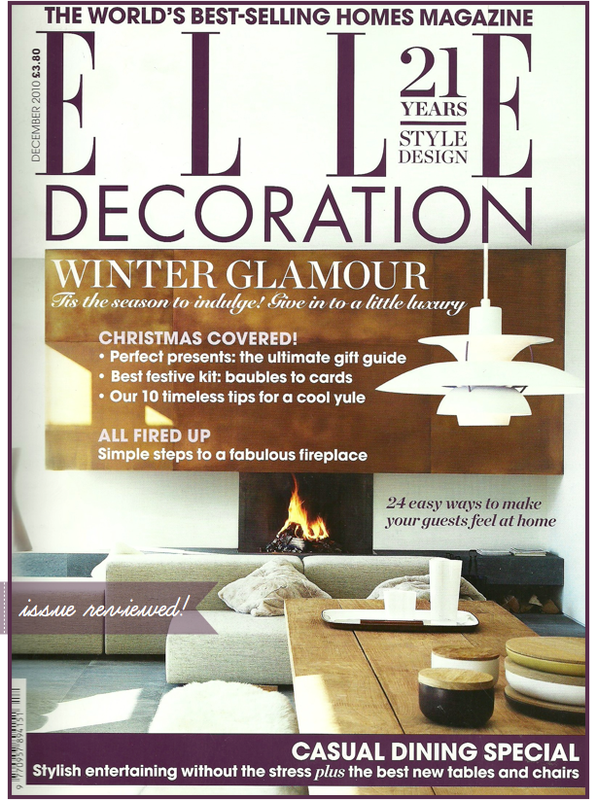 Given they are the cool kid on the block, it's no surprise to see Elle Decoration deliver a December issue far removed from green and red Christmas features, instead inspiring for the holidays in a more subtle, unique way. 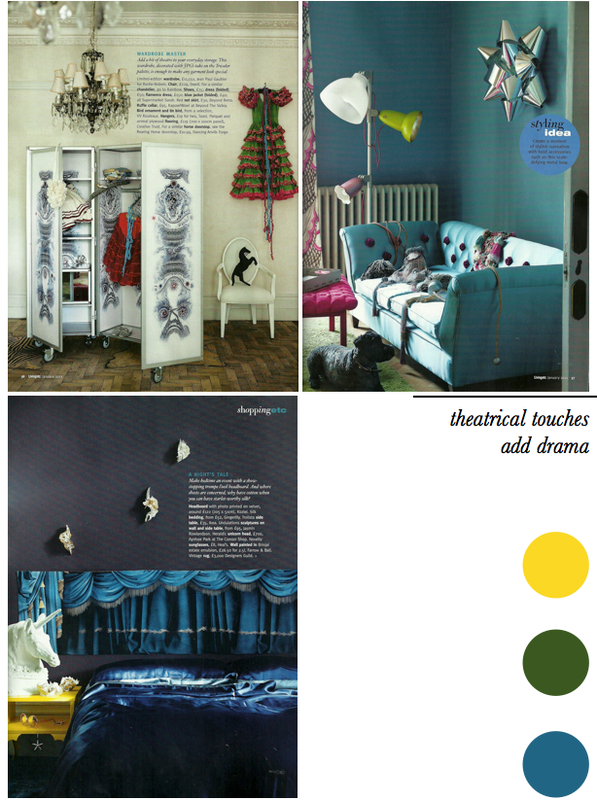 A cracking gift guide opens the issue, along with news on all the latest products for the home, including the 'Cotton Tree' wallpaper by MissPrint and fabrics from Osborne & Little. 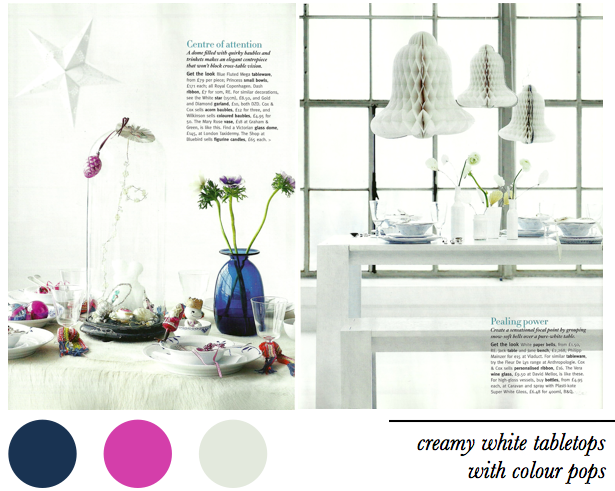 This month's 'easy decorating' feature shines the spotlight on purple and offers advice on how to introduce various hues into a scheme. 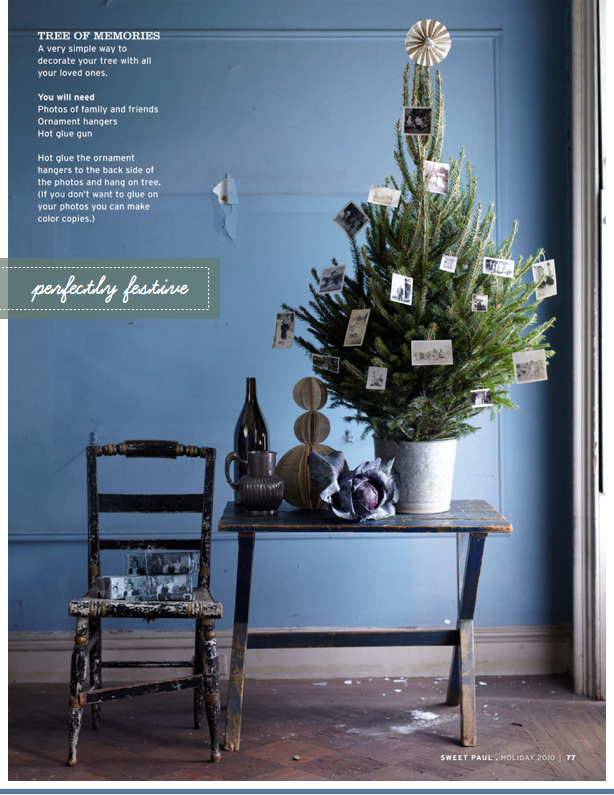 The 'easy updates' feature that follows is by far my favourite of all the stories within the December issue; wonderfully whimsical and bursting with comforting warmth, their Ten Commandments of Christmas are all spot on. 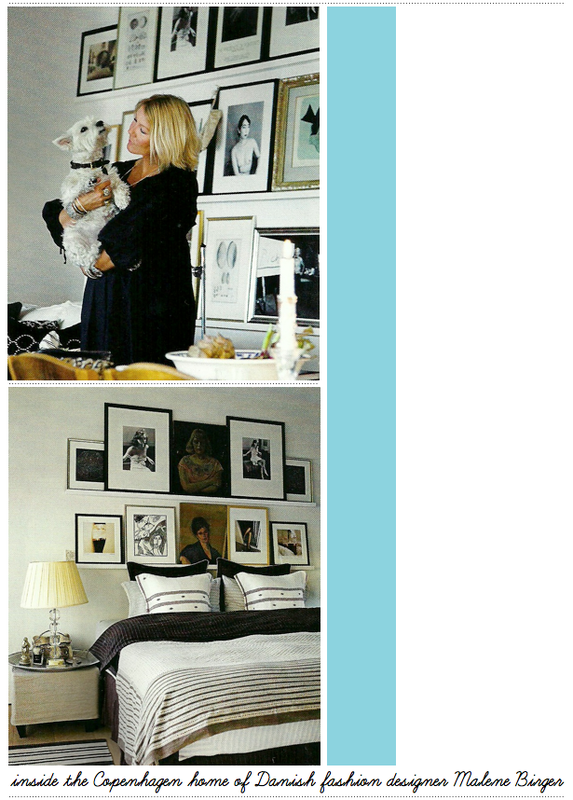 A close second favourite was the 'at home with' feature, which tours the Copenhagen home of Danish fashion designer Malene Birger. Before heading into the home tour section at the back, congratulations must go to one of my textile favourites Donna Wilson, who won the Designer of the Year award at The British Design Awards 2010. 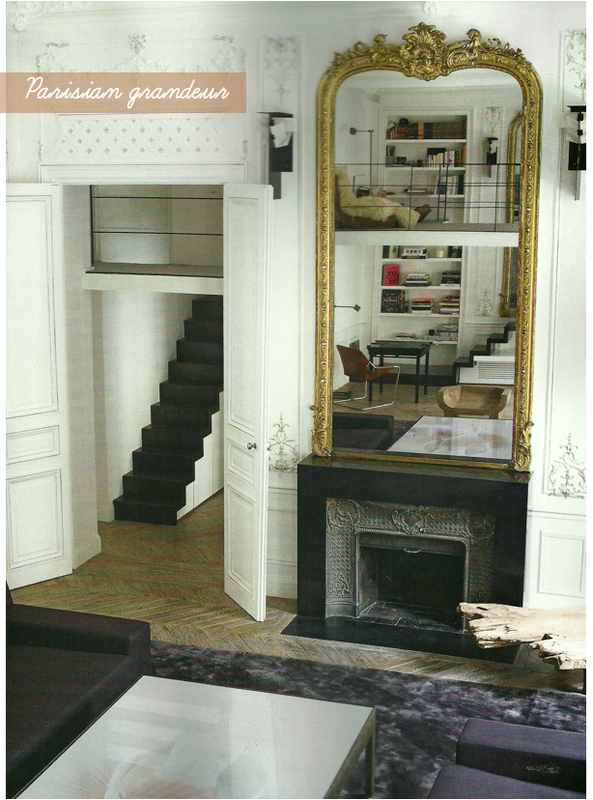 There's just time to mention the five home tours within the issue - see below for a peek of the Vals and Parisian homes they featured. 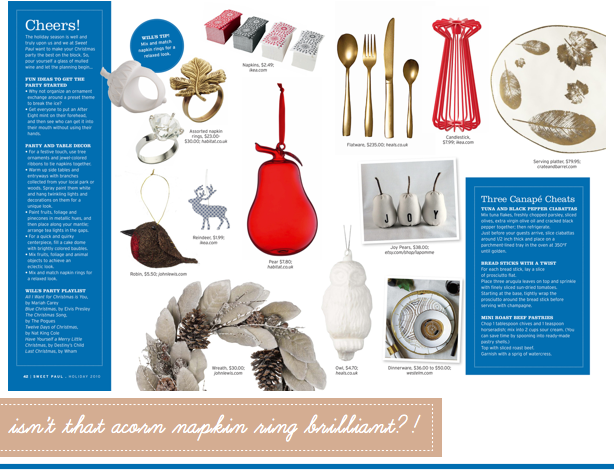 Finally, if you are planning on entertaining over the holiday season be sure to read their feature on casual dining. OK, enough of my picks, what has you excited about this issue? Tuesday just became a whole lot more interesting, friends! 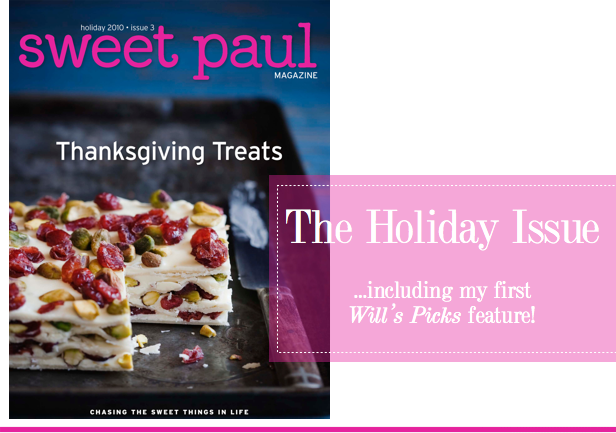 Yep, the first ever holiday issue of Sweet Paul magazine is now live and as the biggest issue to date, it's positively bursting with inspired ideas for foodies, entertainers and crafters alike. It will always be a special issue for me as it includes the first iteration of the Will's Picks feature. 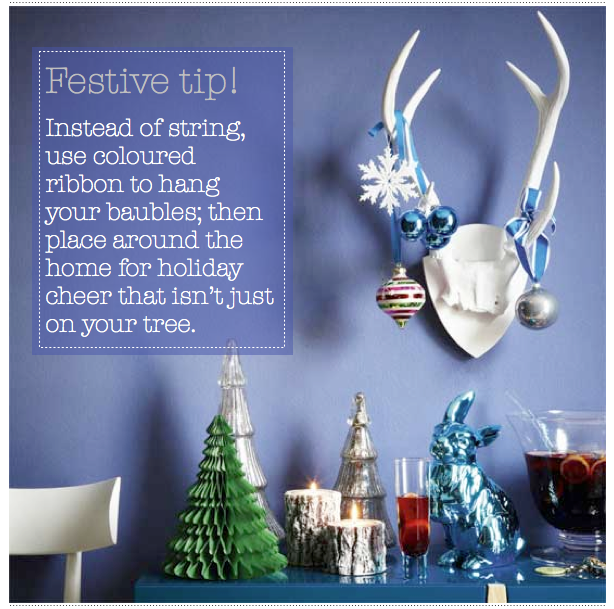 Each issue I'll be sharing hints, tips and ideas for decorating, entertaining and crafting. 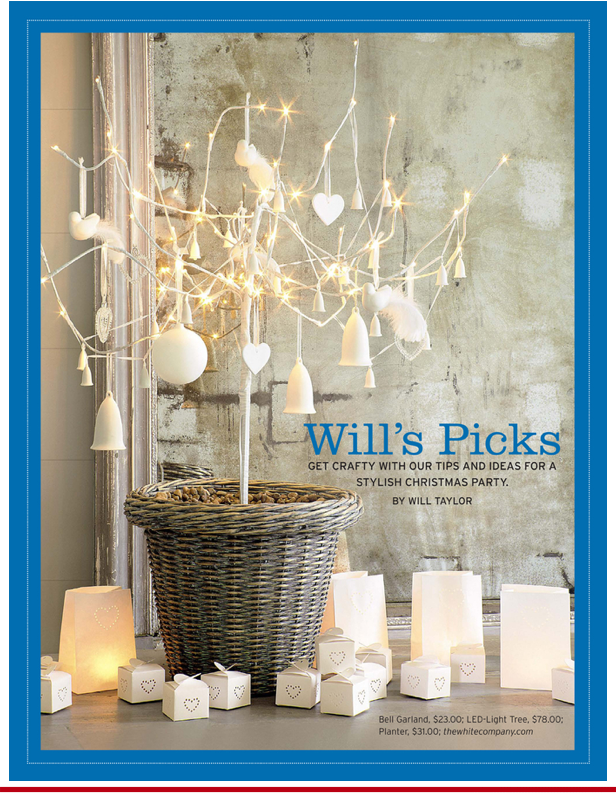 This issue I've written about throwing the best Christmas party on the block, including table and home decor tips to quick canape recipes and ideas for getting the party started. Do let me know if you happen to try any of the craft/decor projects, games or foodie items out - I'd love to hear from you! Given the issue is a joy from start to finish I really wanted to share some of my favourite pages from it. 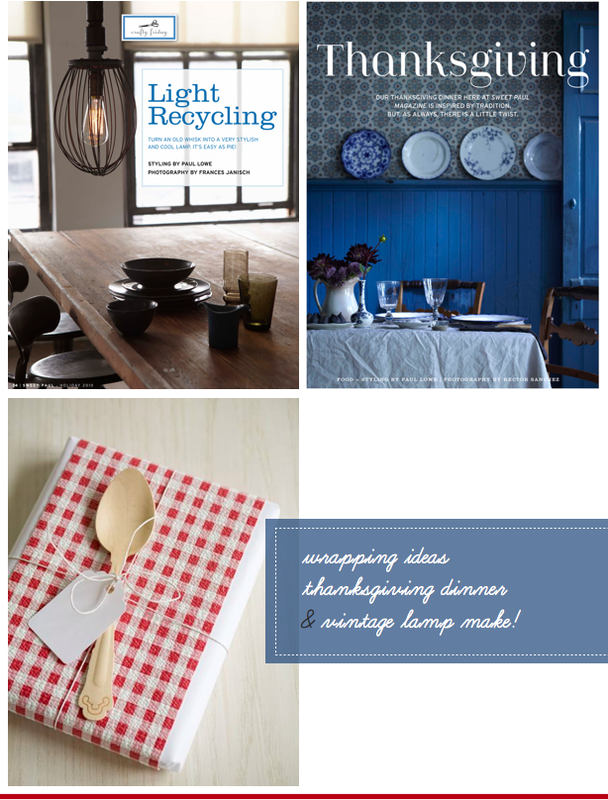 However, as the styling in the magazine is so super duper inspiring, I couldn't pick a number one story but I do keep clicking back to Light Recycling, Thanksgiving and A Cake Tin Full of Memories. Which story is your favourite?